Where do I start with this movie? Growing up, I had this on VHS and watched it so much the tape stopped working. I knew all the songs by heart, and even 20 years later found myself singing along to the tunes all the time. I grew up in the early nineties when Disney was experiencing a resurgence with films like this, The Little Mermaid and Beauty and the Beast. Most of those films had a princess front and centre, which didn’t attract the attention of a young GI Joe loving ten year old too much. Aladdin was the first Disney movie to appeal to me as a kid. I loved the songs, the characters, and the story. Watching it now, I can also appreciate the animation quality which, surprisingly enough, still holds up today. 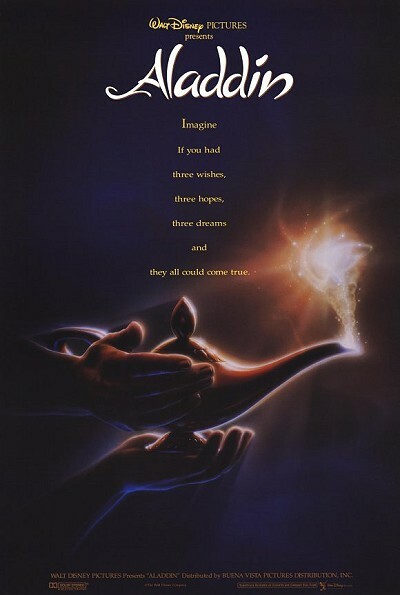 Robin Williams is amazing as the Genie; he definitely steals this movie. I’d love to see a clip of his out takes because I’ve seen Williams improvise and I’m sure there are hours of him going nuts as the Genie in the Disney vault somewhere. While Robin Williams gets a lot of kudos as the Genie, and deservedly so, the rest of the cast is not to be forgotten. I love Gilbert Gottfried as Jafar’s sarcastic pet parrot Iago. He has some really hilarious lines throughout the film. His hatred of stale crackers being one of the highlights. I really enjoyed Jafar too, he’s a menacing villain and you’re glad when he gets what’s coming to him by the end of the film (sorry for the spoilers that the good guys win in a Disney movie). DJ Tanner’s boyfriend Scott Weinger is fine as Aladdin and Linda Larkin as Princess Jasmine, but this is William’s show and he laps it up. There are quite a few sight gags in this film also, mostly by the flying carpet and Aladdin’s pet monkey Abu. They are still amusing, even to me a 31 year old man. I can’t imagine how hilarious they would’ve been to ten year old Benny D. I’m really surprised I enjoyed this as much as I did. I wasn’t expecting to enjoy a movie I adored as a ten year old so much, but I absolutely did. The movie really holds up today, despite being surrounded by the brilliance that is Pixar. This is the hey day of Disney films as far as I’m concerned, nearly everything they did over a five or six year span was great. They could do no wrong during a span when they released The Little Mermaid, Beauty and the Beast, Aladdin and The Lion King. I love this movie, I’m going out now to buy the soundtrack. Even 20 years later, the songs are so memorable and catchy. Finally, our first Disney movie! I very much grew up on Disney animation. The first VHS I ever owned was Lady & the Tramp. My mother spent hours meticulously piping an icing Ariel onto my fifth birthday cake. I was obsessed with The Lion King, mostly because he was voiced by my elementary school crush, Jonathan Taylor Thomas. My sister and I once watched Tarzan everyday after school for an entire week. If it was Disney, I’d watch it. Again and again and again. Aladdin was right in that Disney renaissance period of the late 80s to mid-90s, when the studio made some exceptionally great films. While it certainly isn’t the best movie from this period (my pick is Beauty & the Beast), it does stand out in many ways. For one, the lead character is male. You don’t often see this in the Disney universe, and certainly not in recent years with the explosion of princess merchandise. This movie is also notable for casting Robin Williams as the voice of Genie. Prior to Aladdin, animated films were not marketed on the basis of having big stars providing voice talents. Williams became a big part of the advertising, and with good cause: he absolutely shines, thanks in large part to Disney allowing him to run wild in the studio and improvise much of his dialogue. This is definitely an underrated gem.